Premium unitized curtain wall and custom-built façades are par for the course in today’s highly creative building designs. Framed by tightening schedules and smaller budgets, successful commercial building projects need all stakeholders pulling on the same rope. With the increasing complexity of façades, glazing contractors are relying heavily on accurate glass specifications to carry out their jobs. From project conception to completion, specifications provide a necessary “check and balance” to ensure that the proper products are being used and that current industry standards are being followed. Although glazing contractors need to follow industry best practices, such as proper procedures for glass setting and using the proper glazing sealants, when installing the fabricated product, it’s equally important for them to review the glass specifications in their entirety to identify any “red flags,” errors, deviations from industry standards, special requirements or specific architect requests. That’s not to say the entire responsibility falls on the glazing contractor. Because not all specifications are created equal, every party in the supply chain that receives the specification for a particular project—architect/specifier, general contractor, fabricator, raw materials suppliers—is accountable for ensuring that the product it manufactures complies with current standards. An enormous amount of detail makes up a specification. It can address edicts ranging from general industry-accepted practices to precise performance criteria, such as glass characteristics, thermal and optical properties, and surface orientation for low-e coatings in an insulating glass unit (IGU). Yet, with building designs becoming more intricate and complex, it’s increasingly likely that an architect or specifier will add a spec to a construction document that deviates from industry standards. So, how can glazing contractors best ensure that nothing falls through the cracks, and that the installation of the fabricated IGUs will comply with the specification and meet all stakeholder expectations? With hundreds of potential variables in any single glass specification, it’s understandable that a detail might get overlooked at any point in the process. The impact of such an oversight, though, can range from a developer who is dissatisfied with the appearance of the constructed building to the replacement of all the glass on a project because a performance specification was missed. So, regardless of the fallout, there is a “price to pay” for an inaccurate spec. 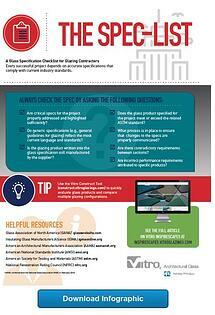 Are critical specs for the project properly addressed and highlighted sufficiently? Do generic specifications (e.g., general guidelines for glazing) reflect the most current language and standards? Is the glazing product written into the glass specification still manufactured by the supplier? Does the glass product specified for the project meet or exceed the related ASTM standard? What process is in place to ensure that changes to the specs are properly communicated? Copied and pasted specs. Although a time-saver, copying and pasting information from similar projects can result in references to incorrect products and documents that have been decommissioned. Even though specifications contain standard, generic language, it’s critical to review that language for each project, as glass specs and building codes occasionally change. Outdated standard and test method references. Obsolete standards and test methods can yield additional costs or installations that aren’t up to code. In addition, customers can receive inferior products or products that don’t meet current standards. Be aware of industry performance standards that have been updated or withdrawn, and double-check that any standard referenced in a specification reflects the most current version. Incorrect products. This issue manifests itself in several ways, including an erroneous or discontinued product that has been specified for a specific application, or a product brand that doesn’t correspond to the specified manufacturer. It’s a good idea to question specifications of custom products (e.g., tempered glass might not be needed to meet code). Also make sure that treatments such as low-e coatings, opacifiers and frits are appropriate for the surfaces in IGUs and spandrels. Master Format numbers – Are they current? Referenced companies and suppliers – Are they still in business? Consistency of requirements – Do they agree across all sections of the spec document? Performance requirements attributed to specific products – Are they correct? Composition of the product being specified – Is the information provided sufficiently specific? Once issues are identified, it’s critical that glazing contractors inform their subcontractors. So, the specification for a project arrives, and all seems to be in order, a fairly standard job. Perhaps the project isn’t so “standard.” If glazing contractors focus only on, for instance, the performance criteria for the glass makeup or received just a few select pages of the specification—not the entire Master Spec document—key information could be missed, resulting in a building that falls short of expectations. The architect has developed a very detailed spec that calls for heat-treated glass to meet the strength criteria for the building. To avoid a distorted, wavy look, the architect designates a “critical performance spec” for flatness. However, this information ends up in a section of the specification that other parts of the supply chain don’t typically review. The resulting glass product does not meet the architect’s requirements and he or she starts looking for a supplier to blame. Although the work glazing contractors perform is based only on what the general contractor or architect provides, conducting a little “detective work” can go a long way. Check the entire specification, if feasible, for deviations or critical performance requirements that may be in a different part of the specification. In addition, communication with upstream and downstream partners is vital. Because they are often more familiar with the overall scope of a project, general contractors can provide valuable insight into the visibility of, or expectations for, the project. For example, the glass specification for a new building being constructed in a major city and surrounded by iconic structures will likely have unique characteristics – perhaps the ASTM specification for a ¼-inch coating void is changing to ⅛-inch because the glass is in a high-traffic area of the building. Knowing the project’s prominence, the general contractor can “tip off” the glazing contractor of a potential deviation in the specs, such as a requirement that is tighter than normal ASTM specifications. Glass Association of North America (GANA), now combined with the National Glass Association (NGA), serves the architectural glass and metals industry, including glazing contractors, full-service glass companies, glass fabricators, primary glass manufacturers and suppliers to the industry. GANA produces the GANA Glazing Manual, a comprehensive set of recommendations and guidelines for all aspects of glazing applications and methods. The information was developed, vetted and approved by committees representing glass suppliers, fabricators, glazing contractors and other trade organizations. Insulating Glass Manufacturers Alliance (IGMA), an international standards-development association for the insulating glass industry. Alliance members include insulating glass manufacturers and suppliers of related equipment, services and materials. IGMA’s North American Glazing Guidelines for Sealed Insulating Glass Units for Commercial and Residential Use contains advisory guidelines on all aspects of IGUs, such as glass types, framing, glazing clearances, setting blocks, spacer shims, and glazing materials and systems. American Architectural Manufacturers Association (AAMA), which represents window, door, skylight, curtain wall and storefront manufacturers for residential and commercial sectors. 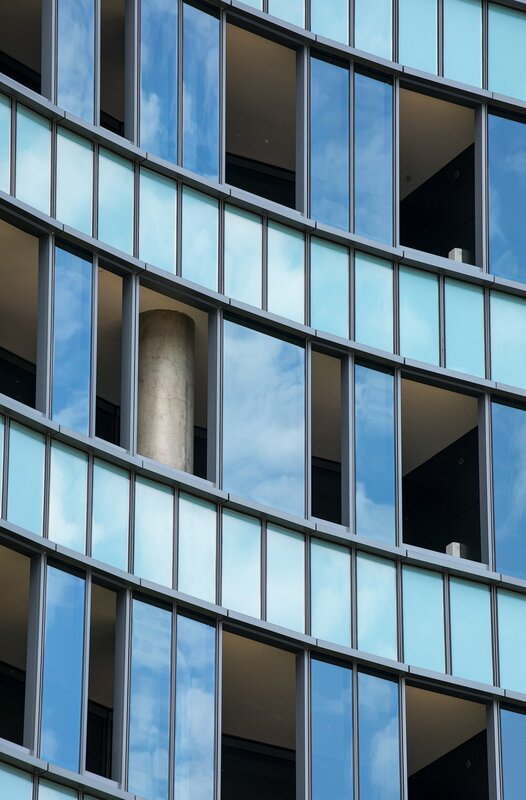 Comprising members from fenestration product manufacturers and their material and component suppliers, AAMA develops and updates the standards that are referenced in many national and state building codes, and participates in the annual International Code Council Code Adoptions. American National Standards Institute (ANSI), which coordinates the U.S. private-sector, voluntary standardization system. ANSI provides a neutral forum for the development of policies on standards issues and serves as a watchdog for standards development and conformity assessment programs and processes for hundreds of industries. The ANSI Z97.1 standard establishes the specifications and methods of testing for the safety properties of safety glazing materials used for all building and architectural purposes. This standard is an important element in architectural specifications for safety glazing compliance. American Society for Testing and Materials (ASTM), which develops and delivers voluntary consensus standards. Through more than 140 technical standards-writing committees, ASTM provides recommendations and specifications for a broad range of industries, including architectural glasses used in building construction. National Fenestration Rating Council (NFRC), an independent, non-profit organization that establishes window, door and skylight energy performance ratings. A complement to these industry resources is Vitro Glass’ “Construct” tool, which lets glazing contractors search, construct and compare virtual configurations for monolithic glazings, multi-pane IGUs, and decorative and spandrel glasses. Three-part specifications in the Construction Specifications Institute (CSI) format can be quickly generated for any configuration created in “Construct,” as long as it contains 100-percent Vitro Glass products. The 3-part CSI specification lists performance data for individual glazing configurations such as glass thickness, visible light transmittance, interior and exterior reflectance, winter nighttime u-value, solar heat gain coefficient and light-to-solar gain ratio. One of the keys to a successful building project – one that achieves the look architects envisioned when they designed and spec’d the job – involves the development of and adherence to accurate specifications. Architects set the tone for building projects, but every other element in the supply chain, including the glazing contractor, fabricator and raw materials suppliers, is responsible not only for providing their selected component in compliance with the final glass specification but also ensuring that those specs are accurate and thorough and reflect the most current industry standards. Numerous resources, such as GANA/NGA, IGMA and AAMA, supply industry best practices, recommendations and specifications that are readily available to help in the glass-specification process. Each of these organizations comprises experienced professionals, who serve as “voices of the industry” to develop the recommendations and best practices for the architectural glass trade. 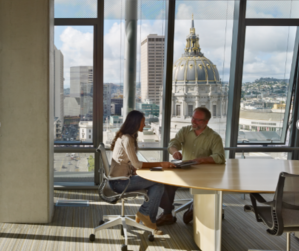 To learn more about the glass-specification process and helpful resources for writing clear, up-to-date specs, visit www.vitroglazings.com or call the Vitro Architectural Services Team at 1-855-VTRO-GLS (887-6457).